Milwaukee is best known for being America’s beer capital. But, as today’s GSB News & Notes demonstrates, Wisconsin’s largest city is also an up-and-coming Green-Sports hub. Brewers’ pitcher Brent Suter recently showed himself to be an eco-athlete to be reckoned with. He wrote an OpEd in Fast Company, urging Americans to unify around finding solutions to climate change. And Fiserv Arena, the brand new home of the NBA’s Bucks, opened its doors as the world’s first bird-friendly arena. Brent Suter is a busy man this offseason. 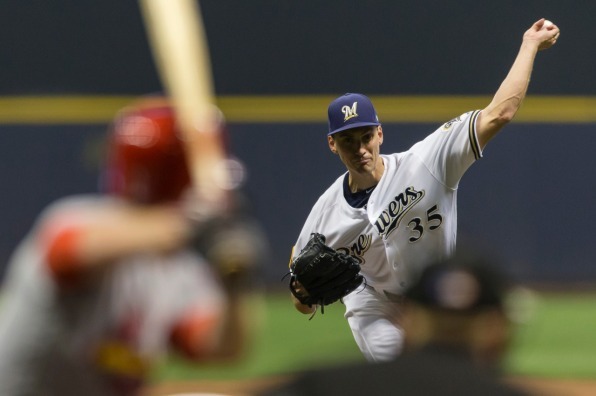 The 29 year-old lefty pitcher for the Milwaukee Brewers is rehabbing from Tommy John surgery^ in August that repaired a torn ulnar collateral ligament (UCL) in his elbow. Since recovery from this procedure takes a full year, the hope is that Suter will be able to rejoin his teammates for their stretch run to the playoffs next summer. And, during breaks from his rehab regimen, Suter penned a thoughtful OpEd that ran in Fast Company’s October 31st issue. He first went local, pointing out how climate change is very relevant to Milwaukee, citing a recent study that showed drought, heatwaves, and extreme weather associated with climate change will drastically reduce crop yields of barley, a key ingredient in beer. GSB’s Take: I’ve often heard that the complexity of the climate change issue is main reason there are few athletes who speak out about it. With this OpEd, Brent Suter clearly knocked the complexity canard out of the ballpark. I have no idea what Suter’s post-career plans are, but perhaps he should consider transitioning from eco-athlete to eco-politician. Here’s something that hasn’t been said in, oh, 40 years or so: It is an exciting time to be a Milwaukee Bucks fan! The most recent example of the Bucks’ emergence? Last night’s 134-111 rout of the two-time defending NBA champion Golden State Warriors in Oakland. Milwaukee is 9-2 and in second place in the Eastern Conference. To top that off, Bucks fans get to watch their squad in the brand new Fiserv Forum, which is on track to receive LEED Silver certification. And thanks to a forward-thinking collaboration between the Bucks and Bird City Wisconsin, it is also a good time to be a bird in downtown Milwaukee. That is because Fiserv Forum will be the world’s first bird-friendly sports and entertainment venue. The 17,500-seat arena was designed to achieve the U.S. Green Building Council’s new LEED Bird Collision Deterrence credit, which was created in partnership with American Bird Conservancy (ABC). To earn the credit, a building must address the primary reasons that birds collide with buildings: reflective and see-through glass and lighting that disorients birds during their nocturnal spring and fall migrations. Bird-friendliness was built in to Fiserv’s Forum’s design in mid-2015, when Bird City Wisconsin — a program of the Milwaukee Audubon Society — first approached the Bucks. Why does this matter? Because up to one billion birds die annually after colliding with glass in the United States. Scientists estimate that this likely accounts for five to ten percent of all birds in the U.S. and is a contributor to significant declines in bird populations across North America. GSB’s Take: That the Bucks and Fiserv Arena stepped up on bird conservation casts in sharp relief the failure of the Minnesota Vikings to do the same. Bird conservation advocates and architects let team owner Zygi Wilf know, during the planning phase of what would become US Bank Stadium, that the building as designed would be hazardous for birds. Sadly, the team decided not to make the investment in bird collision deterrence. Not surprisingly, the stadium, which opened in 2016 and is located in a highly-trafficked portion of the Mississippi Flyway, has a significant collision problem. Click here for a link to a December, 2017 GreenSportsBlog story on the US Bank Stadium-bird collision issue. ^ Tommy John surgery is a procedure in which a healthy tendon extracted from an arm (or sometimes a leg) is used to replace an arm’s torn ligament. The healthy tendon is threaded through holes drilled into the bone above and below the elbow. * The Brewers reached the National League Championship Series where they lost to the Los Angeles Dodgers.